Congratulations on your winning content finalist. 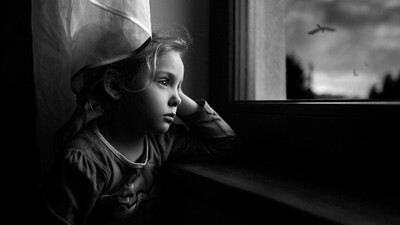 Stunning b/w image skillfully captured ... Love the amazing clarity of focus, detail and lighting. Congrats on your awards, well done. At home. I was sitting in fornt of computer and my daughter was staring outside the window. Soft light comming from north direction is best. Here is an example! Actually nothing. That was that moment that creates a thought crossing your mind within second and giving you that image. conversion to BW and some D&B. I added clouds and bird. Try to catch you child when is completely focused on playing with toys.